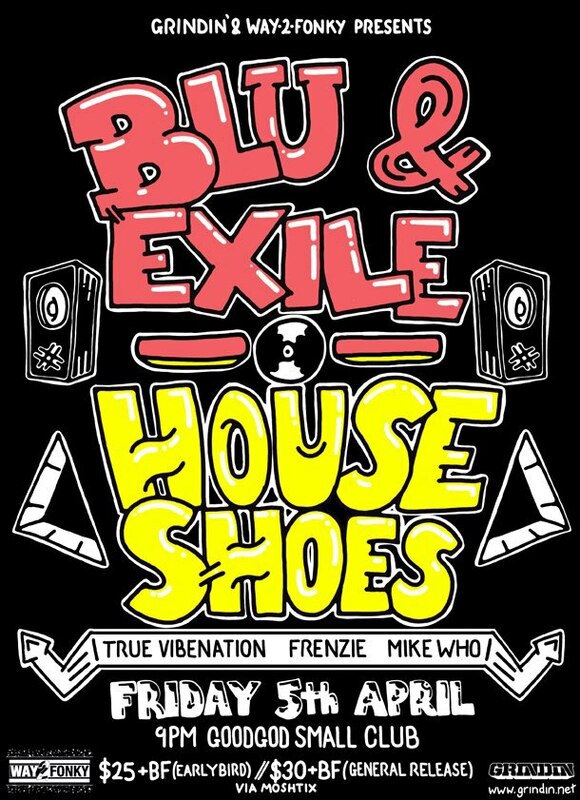 Three heavyweights in the form of Blu & Exile and Houseshoes are touring around Australia and New Zealand as we speak, and we in Sydney are lucky enough to have them doing there thing this Friday in the house of awesomeness that is Goodgod small club. They are supported by the always killer True Vibenation with Frenzie and myself on Turntable duties. If you haven’t copped a ticket yet, stop sleeping it’s 25 bones. Here is a quick mix of all things Blu, Exile and House Shoes i knocked up to get everybody in the mood for Friday night. This entry was posted in DJ Mike Who, Mixtapes and tagged Blu & exile, dj house shoes, house shoes, Mixtape, Stolen Records. Bookmark the permalink.